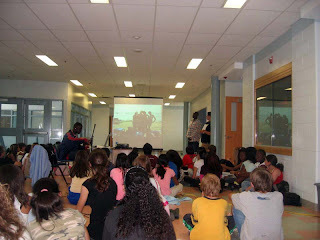 On Friday June 23, 2006, Daniel Francavilla and Michael Onabolu presented to the grade seven and eight students of Our Lady of Providence Elementary School in Brampton. The name of the school Our Lady of Providence is interestingly tied to the Dominican Republic, because one of the local schools started by the Grey Sisters in Consuelo, Dominican Republic is called Divina Providencia, meaning Divine Providence. These both refer to the same person. The presentation included background information about the Dominican Republic, a slideshow of the Dominican Republic Exposure Experience, video clips, followed by questions and an introduction to ACCESS. Thank you to the teachers who arranged this presentation and to the students who helped set up.